Got a super Seagent FreeAgent Pro eSata / Firewire / USB hard drive. Comes a funky module to switch from eSata / USB to dual Firewire 400. Anyway, it also comes formatted NTFS, which is no good, so I reformatted as HFS+ Extended / Journalled. 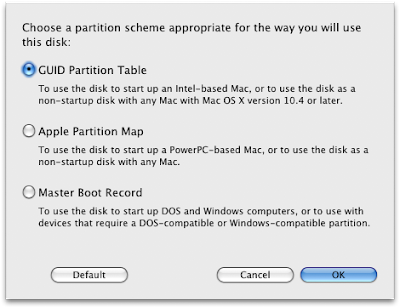 2009-10-27 19:39:47 +0000: Creating partition map. 2009-10-27 19:39:49 +0000: Formatting disk3s1 as Mac OS Extended (Journaled) with name Untitled. 2009-10-27 19:39:51 +0000: Erase complete. 2009-10-27 19:39:52 +0000: Erase complete. 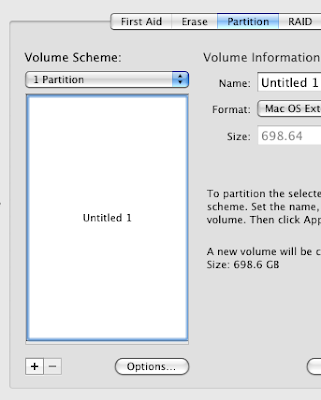 The curious thing is that Apple Partition Map supports bigger partition sizes, I think. PS The drive is GREAT!